Indonesian soldiers and police officers opened fire on the Third Papuan People’s Congress in Jayapura on Wedsneday (19/10) afternoon. The shooting began after the Chairman of the Congress, Furkorus Yebeisembut, declared independence from Indonesia. As communications broke down, text messages began to picture the tensions around the city. A congress participant who was recently released by the police sent this text message to West Papua Media Alerts. It has been translated from Indonesian. Sister/brother, I’ve just left the police headquarters along with other students who have exams this morning. There are still around 800 detainees in the Jayapura Police Station at the moment. Yeboisembut was injured by the police, he is still being interrogated in a special room. Eduard Pariri, Mrs. Sroer, Kelly Pedai, Abraham Kareni, Nova Sroer, DAUD ABON (Governor of Yapen-Waropen and Mamberamo), Mr. Jacob Sroer and Elieser Awon (ex Free West Papua – OPM – member), Mama Sroer and there are still so many other activists, youths, students, petapa [community security force], mama-mama [older women], OPM and others. They are still being detained in the Jayapura Police Station’s tennis court since last night. The repressive and violent act by the authority has caused a lot of injuries to the people, some fractured their skulls, broke their legs, while others suffer serious injuries. We had to sign the letter stating we’ve committed criminal acts as they did not allow us to defend ourselves. Free Papua congress. There will be slaughter of the sons and daughters of Papua, so stay at home and don’t go out until it is safe. But thousands of people have attended the congress since Monday. The original venue for the event was the Cendrawasih University, but it was later moved to Lapangan Sakeus (Sakeus Field) in Abepura, on the outskirts of Jayapura. Papuan video activists said at least 4000 people attended the congress today. The congress itself was not a popular idea, particularly among the armed independence groups. However, Papuan video activists said it was clear today that independence from Indonesia was the hot topic at the gathering. As attendees addressed the issue of independence in their speeches, several hundred military officers began to close in. Good morning, brother, I’m down at the field, and we’re surrounded by the military. Please pray so the congress is safe. Brother, they’ve opened fire … to us all. The TNI’s Regional Commander, Major General Erfi Triassunu, confirmed the declaration of independence during a press conference today: “MRP (Majelis Rakyat Papua – Papuan People’s Council) has declared the separation from Indonesia and plans to establish a new government,” he told BeritaSatu.com. “The police officers were only trying to prevent [the situation from escalating] by firing warning shots to the air,” he said. However, sources on the ground have confirmed that people did get hurt during the panic that ensued. They also claim some people were assaulted by military personnel. 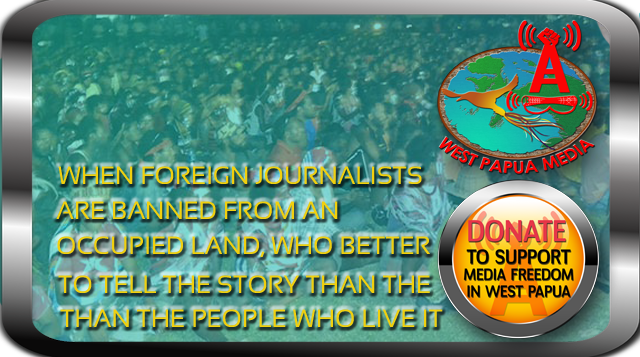 Papuan video activists told EngageMedia that their cameras were confiscated, even though they were not using the devices. Roads are currently blocked in Abepura, as are phone and internet communications. “They all said that the atmosphere is very tense in Jayapura. The anthropologist is worried that they might be “penyisiran” or “combing” this evening like what the Indonesian troops [did] in 2006. Abepura and Waena, where most participants stay, are quite empty now.